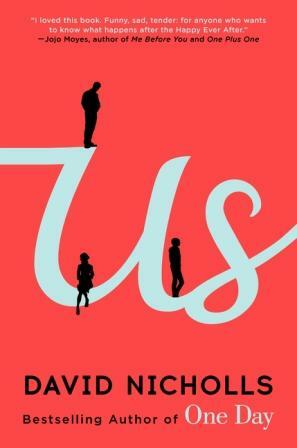 As a huge fan of One Day by David Nicholls, I was eager to read his next book, Us. I was especially pleased to learn that it had been longlisted for the Man Book Prize 2014, because I knew that meant it was going to be a great read. Suffice it to say, the Man Booker committee was right to choose Us. A contemporary novel that explores a twenty-five year old marriage via a family vacation through Europe is certainly not what I expected - its much more. Douglas tells us the tale of how he met, married, and reared a child with Connie through flashbacks, as the couple and their seventeen year old son travel through Europe. You see, Connie decided that they should use the summer before their son, Albie, heads off to university as a way to bond and spend some quality time together. Of course, Douglas didn't count on Connie informing him that she wanted out of their marriage - and on the eve of departure no less! Ack! Douglas is upset, hurt, confused, and doesn't know what to do about Connie's confession. So, they head off to Paris in the hopes of enjoying their time together (and Douglas hopes that this trip will change Connie's mind). However, not all family vacations are going to turn out how you envisioned. In the Petersens case, there are complaints on the first day - too much luggage, not enough alone time, scheduled tour stops, etc. Seems like no one is too happy to be embarking on a trip that will have the trio spending all their time together - well, except for Douglas who is hoping to rekindle his marriage with Connie and create some father-son memories with Albie. This family is unhappy - plain and simple. Douglas had no idea that his wife was thinking about leaving him - he didn't even realize that their marriage was no longer working. As for Albie, well, they never really had a strong relationship, as Albie was more of a mama's boy and tended to connect with his mother over their shared interest of art and the bohemian lifestyle she once lived. Feeling like a bit of an outsider, Douglas' perspective on his relationships are a bit skewed from that vantage point. He doesn't seem to understand where this dissension is truly coming from - he just thinks that he's tried so hard to love them that he's done enough. Learning about their marriage and their son, I couldn't help but feel sorry for Douglas at times. I found Connie to be rather selfish and did think that she preferred to be with her art friends more than Douglas - he was right on that count. As for Albie, I can't really seem to pick up on when exactly he fell out of love with his dad - what happened to cause this rift? Of course, I haven't finished the book just yet, so perhaps Nicholls reveals the moment when all the walls came tumbling down in Casa Petersen. I'm at the point in the story where the trip has unraveled and people have separated and Douglas is now on a mission of redemption (of sorts). I can't wait to find out what happens in Venice. I have to admit I'm loving reading about all of the cities they visit in Europe - its a lovely way to travel. Nicholls has written a wonderful story about a family in disarray. He's created such flawed and realistic characters, that you can easily relate to. He's written about their relationships with such authenticity that you can feel the tension in the air when Douglas doesn't side with his son during a fight at the hotel. And the use of flashbacks to learn about the history of these relationships is fascinating, especially as we get to understand just how delicate these relationships already were before the Grand Tour of Europe. I love how Nicholls makes you feel such empathy for Douglas and has you questioning Connie's devotion to their marriage. As for Albie, he's a character unto himself that I just find to be irritating and rather bratty. I am really enjoying reading this book and can't help but find myself on Douglas' side thus far. Of course, I still have quite a number of pages to go, so who knows where I'll find myself siding with by the novel's end. Either way, I am truly enjoying immersing myself in Nisholls' world. This man really knows how to capture the fragility of family and love so well - its apparent how much thought he's put into these characters and their problems. I love his writing! I didn't know it was long listed! I am one of the few who did not lone One. That's what it was called, right? I might be wrong. I gave up on it less than 50 pages in. Unheard of for me. Ti, yeah it was. I can definitely understand why - Nicholls is an awesome storyteller. One Day was the name of the book and I really enjoyed it, except for the ending. I was disappointed by it and remember posting about it - LOL! It's so sad to me when a marriage dwindles like this one does. I'm very interested in seeing how things turn out for them!